Kobelco Construction Machinery Europe (KCME) has announce the launch of the all-new SK400DLC-10 and SK550DLC-10 demolition machines. The new models, which feature Kobelco’s NEXT system for both high elevation and foundation demolition work, provide a safe and quick solution for the assembly/disassembly of attachments and maintenance and enable easy transportation between projects, for significant cost savings. Kobelco chose the BAUMA exhibition in 2016 to showcase its NEXT Series SK400DLC-9 to the European market for the first time. Feedback obtained from dealers, customers and operators over the next 12 months combined with an increasing demand for demolition and heavy machinery, led to the further improvement and development of the machine before its official launch. The Kobelco SK400DLC-10 is based on the SK350LC-10, sharing the same turbo-charged Stage IV-compliant engine and hydraulic system for high performance and low fuel consumption, while the SK550DLC-10 is based on the larger SK500LC-10. However, utilisation of the Kobelco-developed NEXT system means that the machines can also be adapted for multiple applications on the job site, including high elevation demolition projects as well as breaking up foundations. Each boom attachment is reinforced for increased durability and reduced structural fatigue, and has a block structure that simplifies the assembly/disassembly process in order to reduce downtime onsite. Attachments are connected by hooking the upper (backside) pin to the opposite pins on the lower side – the pressure release to pin fixing can be completed quickly and safely. All attachment joints have the hydraulic piping mounted to the side for easier access and maintenance. 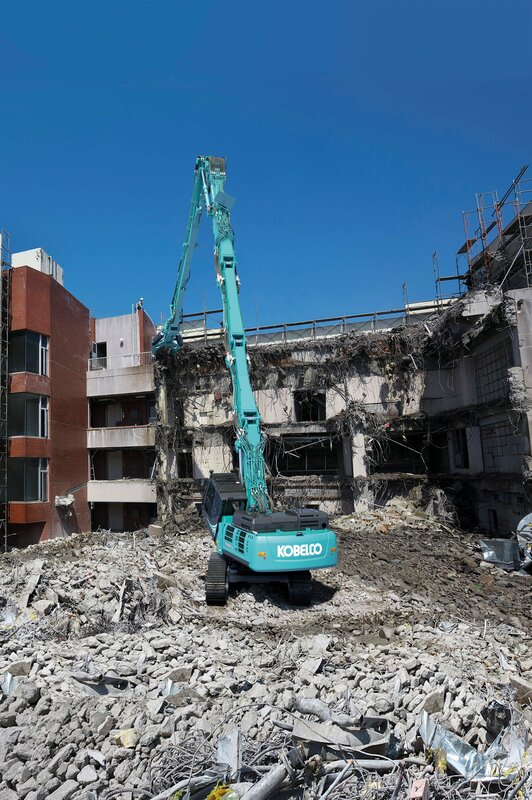 Also contributing to the machine’s longevity, the top plates of the booms have neither been drilled nor welded to avoid additional stress, which is a result of Kobelco’s extensive experience in the Japanese demolition market. The demolition-specification cabin, which is compliant with FOPS level II, can tilt up to 30-degrees so that the operator can maintain a comfortable posture during high elevation demolition work. In addition, the operator has an unobstructed upward view due to the pillar-less design, while parallel windscreen wipers and washers on both the front and top windows contributes to optimum visibility. Cab guards can also be opened for easy maintenance of the windows. The European plastics recycling industry welcomes and fully supports the Plastics Strategy published by the European Commission. 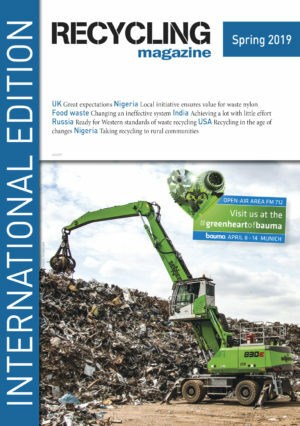 Despite the fact that legislation on e-waste requires reporting only 20 % of the worldwide e-waste collected and treated is documented. 15 years after the implementation of the European WEEE Directive 35 % of the e-waste is documented as being collected and treated.